Tallon Stapler With Staples (Pack of 12) 6085 Pack of 12 Stapler for the secure and easy fastening of documents. Works on a wide range of lightweight materials. Includes staples for complete package. Quality materials are guaranteed not to wear or break. Ideal for personal or small office use. 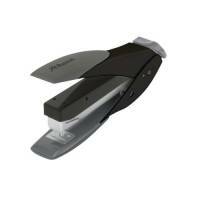 ABS Half Strip Stapler Black WX01056 Pack of 1 Stapler for the secure and easy fastening of documents. Works on a wide range of lightweight materials. Half-strip stapler for compact and reliable stapling. Ideal for personal or small office use. Black. 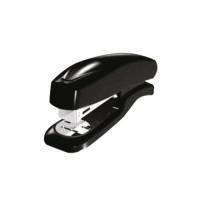 Rexel Easy Touch 30 Stapler Half Strip Black 2102548 Pack of 1 Rexel Easy Touch Flat Clinch Half Stapler. 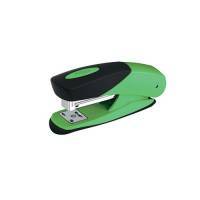 Durable front loading stapler with rubberised grips and vertical stand up design. 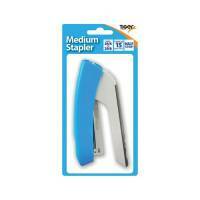 Staples up to 30 sheets and features low staple indicator. Throat depth 45mm. Black. Rexel Easy Touch 30 Stapler Full Strip Black 2102550 Pack of 1 Rexel Low Force Stapler. 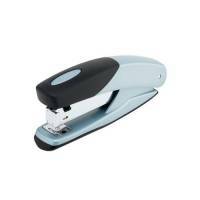 Easy touch full strip stapler with a durable metal construction and rubberised grips for ease of use. Staples with up to 50 percent less force. 30 sheet capacity. Uses No.16 or No.56 Staples. Rexel Optima 70 Heavy Duty Stapler 68mm Throat Depth 2102359 Pack of 1 Rexel Optima 70 manual Stapler. Heavy Duty manual stapler with Flat clinch anvil. Durable metal mechanism. Compact ergonomically advanced shape with soft grips and Quick load front loading mechanism. Staple capacity up to 70 sheets. Staples included. Rexel Optima 40 Manual Stapler 2102357 Pack of 1 Rexel Optima 40 Stapler. 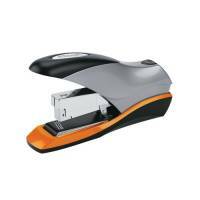 Compact metal stapler with ergonomic shape. Soft grips suitable for hand or desktop use. Quickload front loading mechanism is fast and efficient. Supplied complete with 1000 Optima staples. 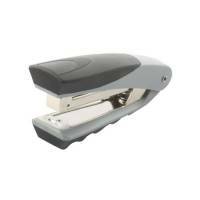 Rexel Gazelle Half Strip Stapler Silver and Black 2100790 Pack of 1 Rexel Gazelle Stapler. A half strip ABS plastic metal combination stapler with a unique enhanced jam-free mechanism. Soft feel non-slip rubber base and integral staple remover. Sheet capacity approx. 25. 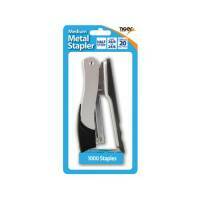 Rexel Centor Half Strip Stapler Silver and Black 2100595 Pack of 1 Rexel Centor Stand-Up Stapler. 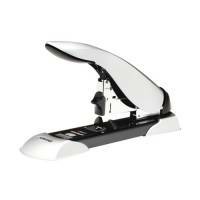 A versatile stapler that can either stand or sit on your desk. Features include a large cushioned finger grip. Moulded from soft feel material making it very comfortable to use. Staples up to 25 sheets of 80gsm paper. 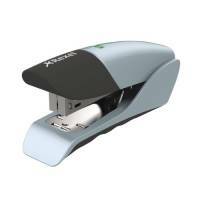 Rexel Gladiator Heavy Duty Stapler Silver and Black 2100591 Pack of 1 Rexel Gladiator Heavy Duty Stapler. Die-cast stapler with adjustable paper depth guide. Jam release. Rear staple loading and a paper capacity of up to 160-sheets of 80gsm paper. Colour - Black. 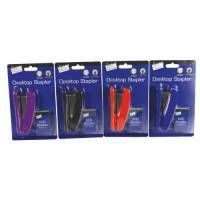 Rexel Centor Half Strip Stapler Translucent Purple 2101014 Pack of 1 Rexel Centor Tranz Stand Up Stapler. 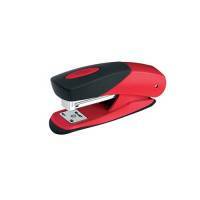 Distinctive stapler that stands vertically or sits horizontally on your desk. Features include a large cushioned finger grip and correctly angled body for comfortable use. Secures up to 25 sheets of 80gsm paper. 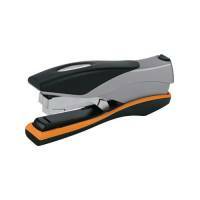 Rexel Torador Stapler Full Strip Silver and Black 2101202 Pack of 1 Rexel Torador Stapler. Robust stapler featuring a die-cast metal construction. Soft feel cap. Non slip base. Integrated staple remover. Jam-free patented mechanism and temporary pinning or tacking function. Sheet capacity 2-25 sheets.